Porpoises, Bowties and Speed Changers, Oh My! 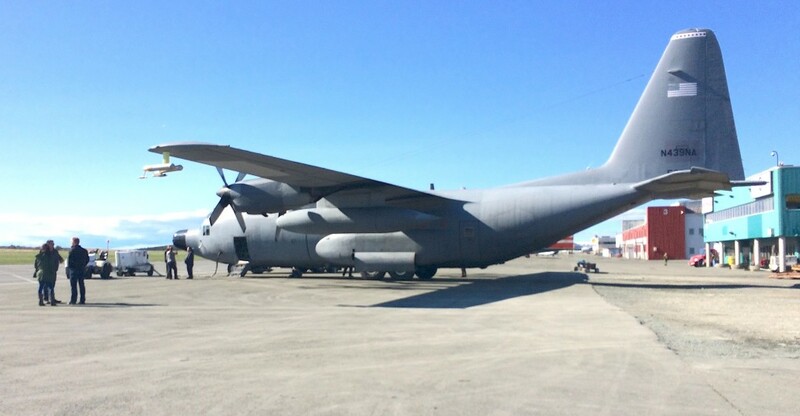 NASA’s C-130 takes off from St. John’s International Airport with about a dozen researchers and scientific instruments on board. The aircraft quickly rises above a blanket of clouds that, from above, look like fluffy, white sand dunes in the sky. The rising sun glares into the right side of the cockpit as the aircraft reaches 16,000 feet. This is the first official 2016 science flight for NAAMES, or the North Atlantic Aerosols and Marine Ecosystems Study, a five-year investigation of key processes that control ocean ecosystem function, their influences on atmospheric aerosols and clouds, and their influence on climate. Tricky aircraft maneuvers are as much a part of the vocabulary of NAAMES airborne scientists as atmospheric particles. “Tail wags,” “porpoises,” “bowties” and “speed changers,” to name just a few. Each maneuver allows scientists to gather data at different altitudes and cover as much of the area as possible, all while confirming the accuracy of scientific measurements. At the nose of the C-130 are five small holes, each tied to a pressure transducer that measures the wind. By doing certain maneuvers, the NAAMES team is able to calibrate and validate vertical wind measurements that are combined with moisture measurements to study particles in and around clouds. A “speed variation” maneuver involves flying the minimum to maximum air speeds of the C-130 for that altitude at about three or four evenly spaced steps. “During the speed maneuvers at each step, the airspeed is held constant, which should in turn hold the pitch angle of the aircraft nearly constant,” said Lee Thornhill, NAAMES researcher. “Tail wags” exercise the horizontal pressure transducers as the aircraft moves from side to side in a crabbing motion. A ‘porpoise’ is a maneuver where the aircraft moves up and down, exercising the vertical pair of pressure transducers on the nose. At lower-levels, the aircraft literally dives through clouds during porpoise maneuvers that map out the air below, within, and above the cloud. Mapping out the clouds from a series of stacked, horizontal levels at longer distances and time frames is known as a “cloud module.” This allows the scientists to establish statistics used to model clouds. 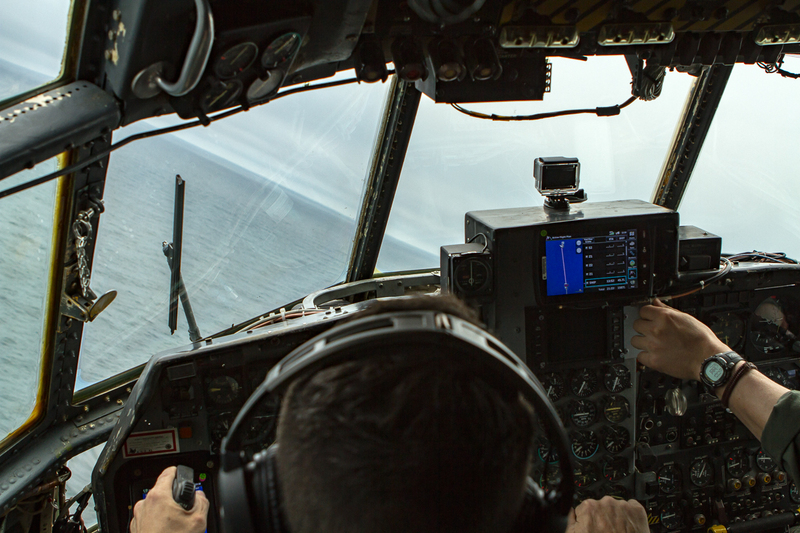 The flight strategy to meet NAAMES science objectives on the C-130 includes many maneuvers and waypoints, or destinations. 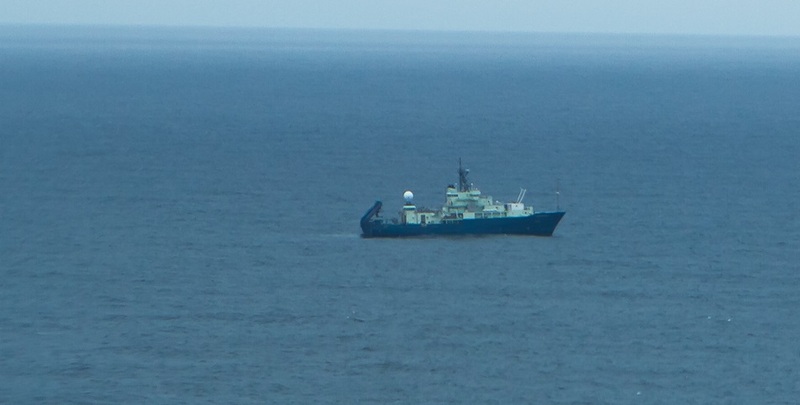 The first waypoint in this case was a high-altitude overflight of a previous practice station for the research vessel Atlantis, which has been in the North Atlantic since May 11. 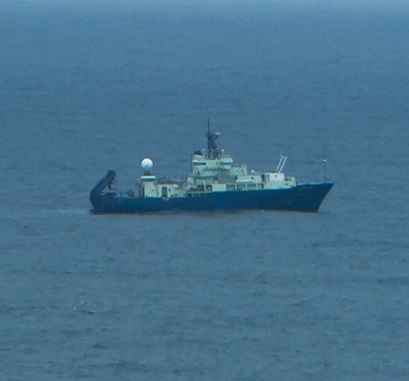 A practice site at sea allows the ship team to test instruments before heading to the research sites in the North Atlantic. It also serves as the first opportunity to compare and complement ship and aircraft measurements that will help to better define the relationship between the ocean ecosystem, the atmosphere and climate. Soon after, NAAMES research scientist John Hair notifies the aircraft team that they are approaching the Atlantis, their next waypoint. The ship appears as a speck above the water and progresses into a large, nearby ship steadily gliding along the wide, open waters. With the few windows of the aircraft crammed with researchers wanting to see the rest of their team at sea, Atlantis passes behind sight under the aircraft’s wing. This would happen once more as the aircraft does a complete Z-pattern, or “bowtie,” directly over the Atlantis for about 4 hours of the 10-hour science flight. To reach the final waypoints of the flight, the aircraft shifts patterns and spirals around to match up with the measurement track from NASA’s CALIPSO satellite. Changes in clouds and atmospheric aerosols, such as dust, sea salt, ash and soot, influence Earth’s weather, climate and air quality. For 10 years, the Cloud-Aerosol Lidar and Infrared Pathfinder Satellite Observation (CALIPSO) mission has orbited Earth taking more than 5.7 billion lidar measurements that probe the vertical “curtain” structure and properties of thin clouds and aerosols. In between the North Atlantic that teems with blooming phytoplankton and the dark, realm of the A-Train satellite constellation, a single C-130 science flight for NAAMES covers vast amounts of biogenic atmospheric territory. For the NAAMES aircraft team, this was only the beginning. Many more science flights will continue through the first week in June – maneuvers and waypoints included.